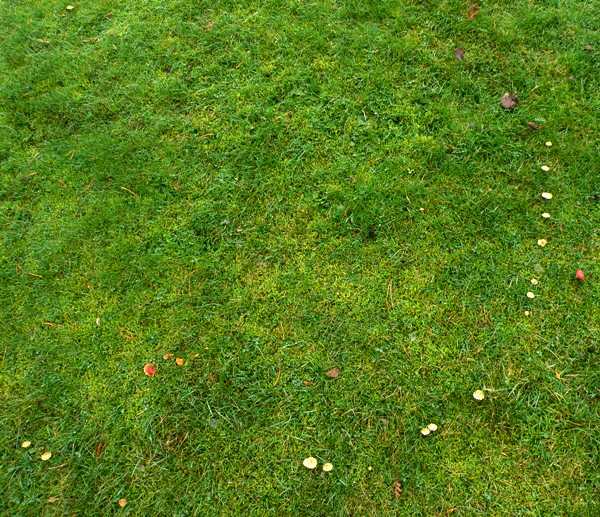 On lawns, Earthy Powdercaps sometimes produce fairy rings several metres in diameter. 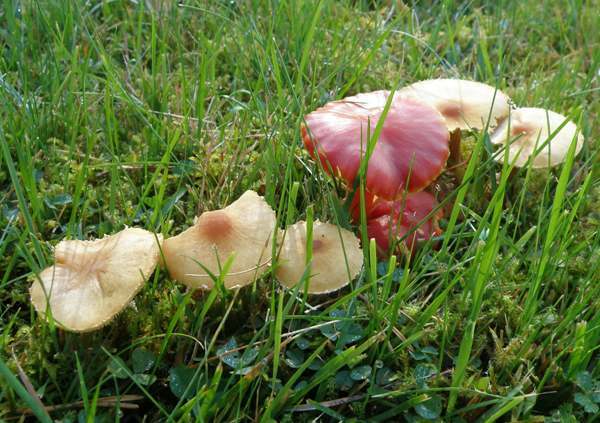 Above: a ring of Earthy Powdercaps 5m in diameter encloses several other grassland fungi including colourful waxcaps (Hygrocybe species) and pinkgills (Entoloma species). 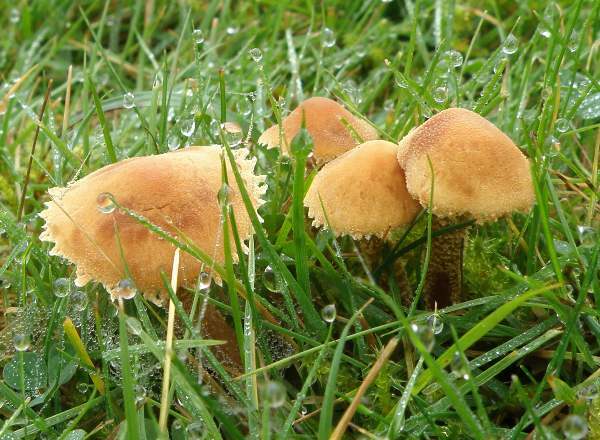 Abundant in all kinds of acid grassland and some woodland habitats in Britain and Ireland, Cystoderma amianthinum occurs also throughout mainland Europe, being most widespread and abundant in cooler northern countries. The Earthy Powdercap is also found in North America. Cystoderma amianthinum, the Earthy Powdercap, can be found in marshy grassland and peeping up through sphagnum moss on the edges of bogs, but it is intolerant of pollution and therefore an indicator of environmental quality. When Giovani Antonio Scopoli described this species in 1772 he gave it the scientific name Agaricus amianthinus. 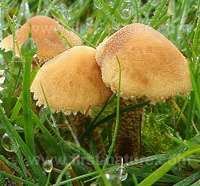 (In the early days of fungal taxonomy most gilled mushrooms were placed in the Agaricus genus, which has since been spread across many genera, leaving in Agaricus only what are commonly called the 'true mushrooms'.) In 1889 the Swiss mycologist Victor Fayod (1860 - 1900) transferred the Earthy Powdercap into the genus Cystoderma, creating its currently accepted scientific name Cystoderma amianthinum. Synonyms of Cystoderma amianthinum include Agaricus amianthinus Scop., Lepiota granulosa var. 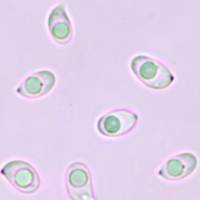 amianthina (Scop.) P. Kumm., Lepiota amianthina (Scop.) P. Karst., Lepiota amianthina var. alba Maire, and Cystoderma amianthinum f. rugulosoreticulatum Bon. 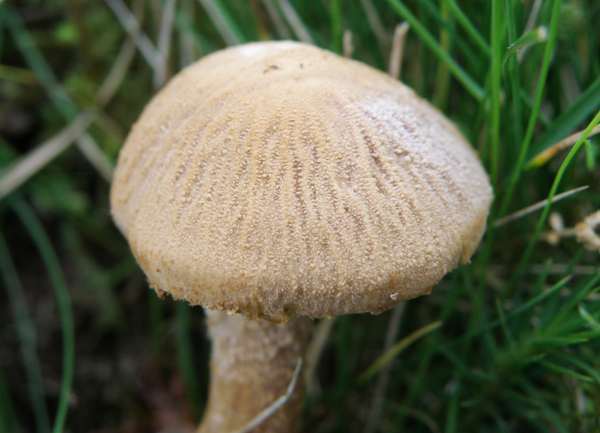 A few authorities recognise the form of Earthy Powdercap with a deeply radially wrinkled cap as a separate species which has been given the scientific name Cystoderma rugoso-reticulatum; however, the majority, including the FRDBI, have reduced this form to synomy. 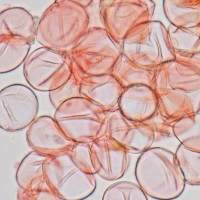 Although a few other Cystoderma species have been recorded in Britain and/or Ireland none of them is common and most are extremely rare. 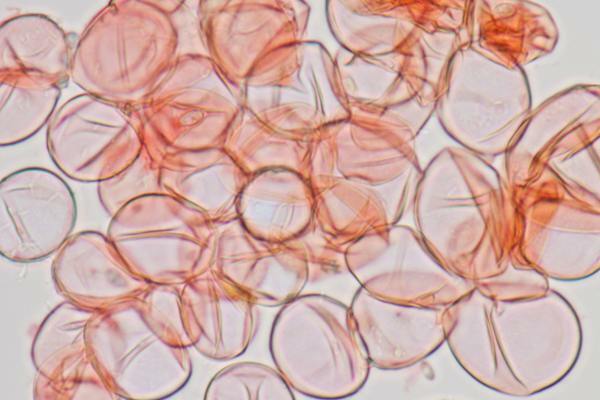 2 to 5cm across; initially convex, becoming broadly convex or flat; colour variable from pale ochraceous yellow to reddish brown (centre darker and umbonate in Cystoderma amianthinum var. rugosoreticulatum); surface finely granular, sometimes radially wrinkled. 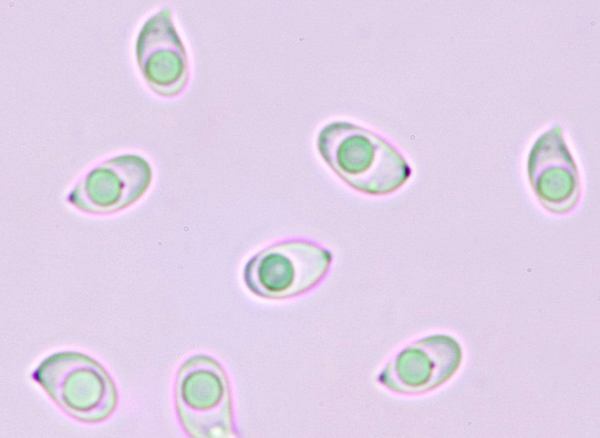 The photomicrograph on the left shows sphaerocysts (globose hyphal cell structures) in the cap of Cystoderma amianthinum. Adnate or adnexed; crowded; white at first, becoming cream. 3 to 5cm long and 4 to 8mm diameter; colour as cap or darker, but paler above ring; smooth or very finely granular above ring, scaly below; cylindrical; small tan coloured, collar-like stem ring is sometimes short-lived but usually at least some fragments of the ring are persistent. Ellipsoidal to oblong, smooth, 5-7.5 x 3-4μm; amyloid. Musty or earthy odour; taste not significant. Saprobic in grassland and woodland edges; on heathland and even on mossy edges of bogs. Squamanita paradoxa, the Powdercap Strangler, is a rare grassland mushroom that attacks the Earthy Powdercap, Cystoderma amianthinum, apparently growing up through its stem and producing a voilet cap in place of the orange cap of the Earthy Powdercap. 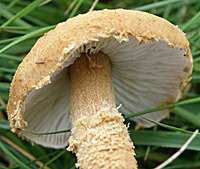 The lower part of the stem remains identical to that of the host mushroom, giving a very strange two-tone effect. Some authorities say that the Earthy Powdercap is an edible mushroom, but many more now categorise it as inedible. Eating bright orange mushrooms is generally a bad idea, as some deadly poisonous Cortinarius species (webcaps) are orange, as also are some of the poisonous dapperlings (Lepiota species) - although the southern European species Amanita caesarea, commonly known as Caesar's Mushroom, is a notable exception to this rule. We are quite sure that Cystoderma amianthinum would not be a good substitute for Caesar's Mushroom! Pat O'Reilly; Fascinated by Fungi, 2016.